When we crowd out things like bagels, bread, milk, and processed and sugary cereals and granola bars, it can feel like we’re not left with many options aside from smoothies (which are my personal go-to!). I’m here today with some good news and a brand spankin’ new breakfast recipe that I think you will LOVE! 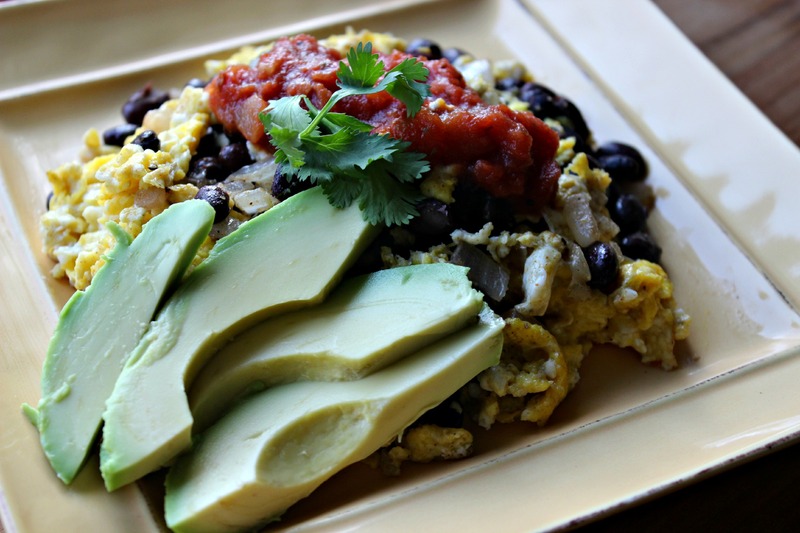 When I was writing last week’s post about my favorite upgraded Mexican-inspired dishes for Cinco de Mayo, I was inspired to blend some of those ingredients together for a filling, satisfying and energizing breakfast dish. As I’ve shared before, the key to all-day energy is to combine Protein + Fiber + Healthy Fats in our meals to keep our blood sugar stabilized. This is important because it helps us prevent blood sugar peaks and crashes, which lead to cravings and trouble controlling our weight. Most of us, especially women, don’t eat nearly enough protein at breakfast (we’re not going to find it in a Nutrigrain bar or a bagel with cream cheese), so we end up feeling unsatisfied and with cravings later in the day. Eating adequate protein at breakfast is one way to combat that. 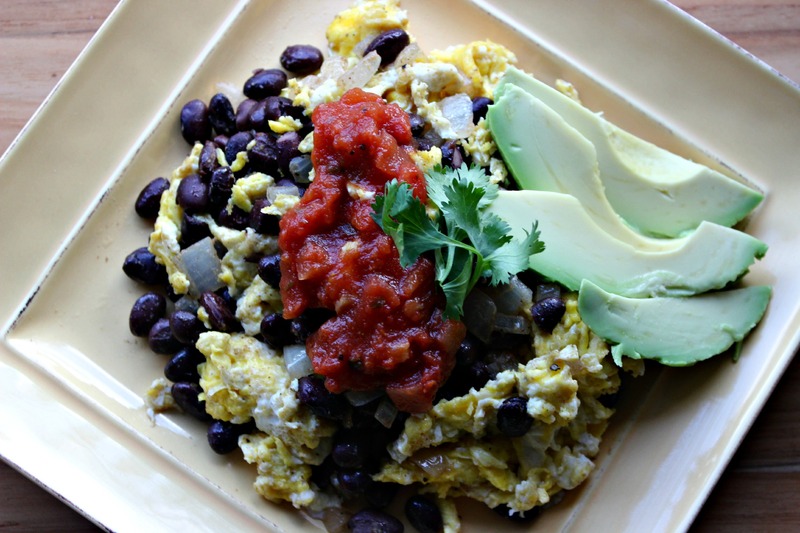 I love this dish because it combines protein (beans, eggs), fiber (beans, avocado), and healthy fats (eggs, avocado)…and it tastes AMAZING! My husband Bill liked it so much that he had it for dinner last night and breakfast this morning. One ingredient in this recipe that I want to focus on is the beauty-boosting, health-promoting avocado. I didn’t even TRY an avocado until I was 25. As a picky eater, I had deemed avocados a “weird” and “gross” food, never having actually tried them. It’s so much easier to write off certain foods than give them a chance and run the risk of not liking them. If you want to geek out a little more, check out the top 12 benefits of avocados from Authority Nutrition. I’m going to dedicate a future post to why we NEED fat, but in the meantime, the bottom line is this: Stop fearing fat. 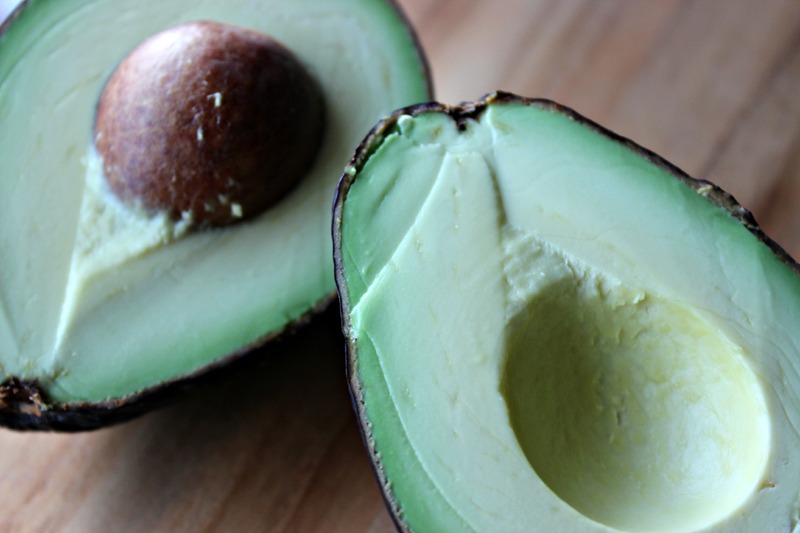 Healthy fats are not making us fat. In fact, most of us don’t eat enough of them. Refined and processed sugars and flours are the key offenders driving our weight gain and health issues. When we started making everything lite, low-fat, and fat-free, we started gaining weight. Eat fat for beauty, health, and happiness 🙂 It makes food taste awesome, keeps us feeling full and satisfied, protects us, and helps us look our best! Add half a tablespoon of coconut oil to a medium skillet set to medium high heat. Add onion, cumin and a pinch of sea salt and black pepper, and sauté for 3-4 minutes, until onion is translucent but not brown. Add black beans and toss to combine. 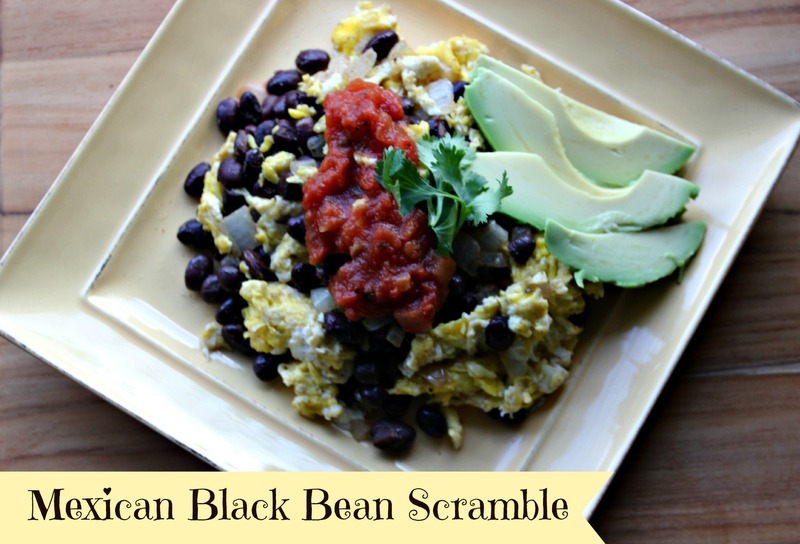 At this point, you can either set the bean/onion mix aside in a bowl, scramble the eggs in the same pan and then add the beans back in (pics above) OR just move to step 3. Add remaining oil to skillet with beans. Whisk eggs together in a bowl and pour them into the skillet. Add another pinch or two of salt and pepper to taste and scramble eggs with beans to your desired texture and consistency. 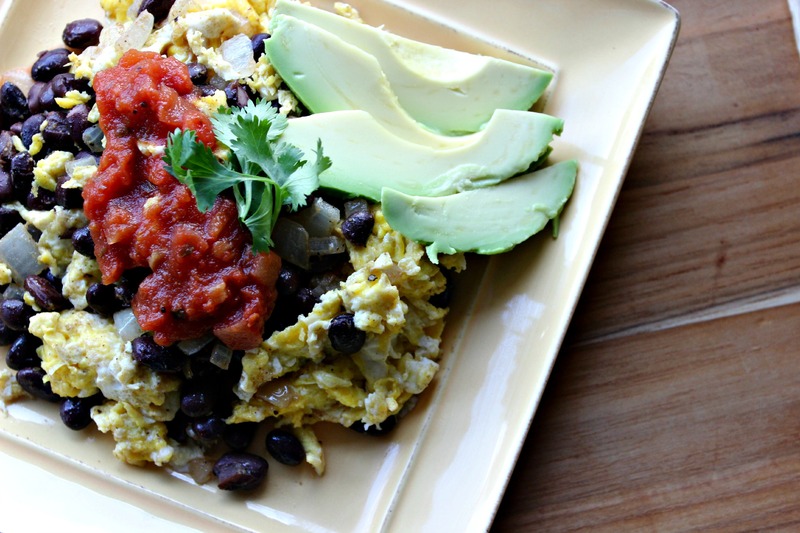 Once eggs are cooked to your liking, put them on a plate and top with salsa, sliced avocado and cilantro. ENJOY!